A feed-in tariff (FiT) is a policy mechanism designed to promote investment in Renewable Energy (RE) technologies by offering long-term power purchasing contracts to RE producers at a fixed premium rate. The FiT is financed by the Malaysian electricity consumers who contribute 1% of their total electricity bill towards a RE Fund when they use more than 300kWh of electricity per month. 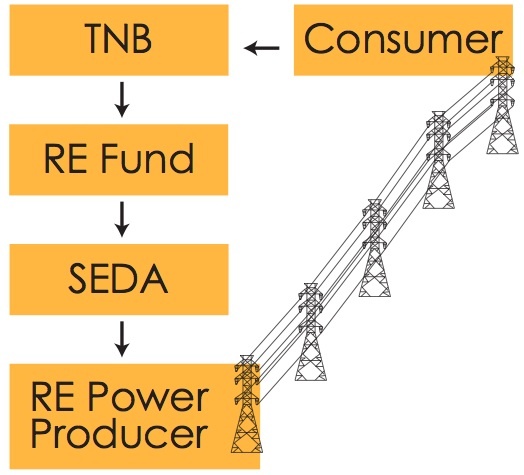 The approved RE power producers will enter into a Renewable Energy Power Purchase Agreement with the Distribution Licensee (TNB) and will be paid for every kilowatt hour of power exported to the grid for 21 years. mySolarPower provides an end to end solution for our clients in the Feed-in Tariff program. We will assist from the beginning of the engineering and design, to the SEDA & FiT applications, through the legalities of a Renewable Energy Power Purchasing Agreement with Tenaga Nasional Berhad. We are able to provide sound advice and consultancy through our extensive experience on how to best achieve maximised returns from the Feed-in Tariff program. For Feed-in Tariff applications under Individual category, we are able to provide financing options for individuals to assist in the complete deployment of Solar PV technology at your home. We have financing packages for PV systems up to RM100,000 over a tenure of 5 years. With our highly reliable PV system and relentless after sales service and support, you can trust that we would endeavor to deliver you the best in solar PV and Feed-in Tariff. To check the available quota of Feed-in Tariff available as of this moment, kindly follow the link to SEDA. *The tariff is subject to revision by the Sustainable Energy Development Authority (SEDA) Malaysia.Please contact us or visit www.seda.gov.my for the latest tariff. System size (in kWp) x Peak Sun Hours x Feed-in Tariff x Number of Days in the Month. Example: A 4kWp residential PV system installed on roof, located in Kuala Lumpur, and commissioned in 2013.